Owners of the Ram truck equipped with the ISB 6.7L Cummins engine have been blessed with a factory exhaust brake from the beginning. This exhaust brake uses the variable geometry turbo on these engines to increase back pressure and thus improve engine braking, when the OEM unit is engaged. While this OEM setup is a vast improvement over wheel brakes alone, it does have some limitations, and with larger trailers you want all the braking you can get when hauling a heavy load. The answer to even better braking with your late model diesel-powered Ram truck is the P-67 LoadLeash from Pacbrake. The LoadLeash complements the factory system and improves braking when needed, and can be turned off when you’re hauling empty. In fact, it won’t even engage when the OEM system is in the off mode. Better braking, no matter your load, improves your towing performance, increases safety, and saves you money by reducing brake wear and thus extending the life of your friction brake components. In addition, unlike the in-exhaust-style restrictor exhaust brakes, the LoadLeash is quiet and can be used in any area, even those posted “No Jake Brake” due to local noise ordinances. What makes the LoadLeash different, you ask? Well, first off, the unit replaces your OEM valve cover spacer, rather than being inserted into the exhaust pipe. Second, it provides braking action on both the compression and exhaust strokes of the engine. Third, it works in conjunction with your factory VGT turbo and exhaust brake. With the LoadLeash activated, the exhaust valves are held a little off the valve seats during the entire two-rotation cycle of your four-stroke diesel. This means you get two braking strokes from the engine per cycle and delete the expansion stroke, which also takes away unwanted power that aids in faster braking. 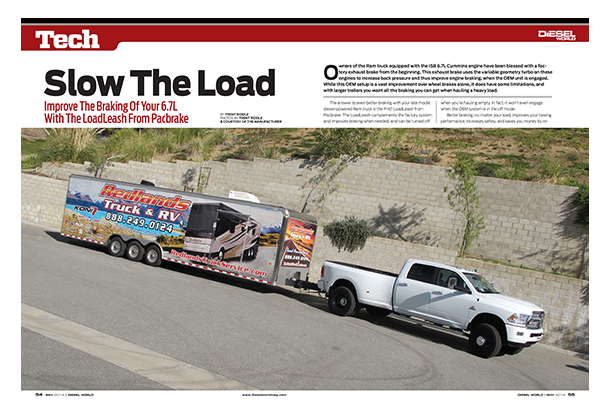 We contacted the experts at Redlands Truck and RV in Redlands, California, and were invited to come see an installation of a Pacbrake LoadLeash and then take a ride and see the difference one makes in braking performance. Since Redland Truck and RV specializes in all things diesel, they’re used to installing all types of braking systems, and repairing and upgrading OEM setups. Our installation took just over a day, but this was partially due to the fact that the install was on a 2013 Ram 3500 and the factory had made a few changes that had to be addressed for the first time. The Redlands crew did this with ease and got it right the first time. We can tell you from experience that the large trailer we towed had a dramatic effect on braking over the unburdened and empty truck alone. In our towing tests, the Ram truck braking was okay with just the factory hydraulic brakes, and better with the OEM exhaust brake. However, engaging the LoadLeash brought in a new level of load control and braking advantage. Even with the factory exhaust brake button on, the large load would push the truck a little on steep downhill sections and the foot brakes were needed. However, with the LoadLeash on, the hydraulic brakes were never needed, during our test, and the accelerator was required to keep up with traffic on the downhill test section. Follow along and we’ll show you the highlights of installing a LoadLeash from Pacbrake. If you’re mechanically inclined, you can do this at home. If you prefer, your local Pacbrake distributor/installer can do it for you and you can use your free weekend to tow someplace and have some fun on the trip as well as at your destination. NOTE: Pacbrake’s integrated P-67 LoadLeash engine brake for the ISB 6.7L Cummins engine fits 2007-13 Ram 2500-5500 diesel pickup/chassis cab trucks and Sterling chassis cab trucks. Owners of other model and years of diesel trucks can benefit from Pacbrake’s PRXB supplemental exhaust brake. This unit installs in the exhaust pipe, and will fit virtually any diesel engine.